A school of fusiliers dropping down the wall on Elmoos reef. This atoll n Weda Bay Halamhera, Indonesia, has a near vertical wall that drops from 1-3m below the surface to around 35-40m depth, the entire wall is covered with corals, sponges and other life. Olympus OM-D EM-1 MkII + Panasonic 8mm fisheye. INON strobes Nauticam housing. Nice reefscape. Might have made a nice vertical as well. Again good strobe work to avoid backscatter. Beautiful foreground and arch of fusiliers, and handsome colors - lovely image. 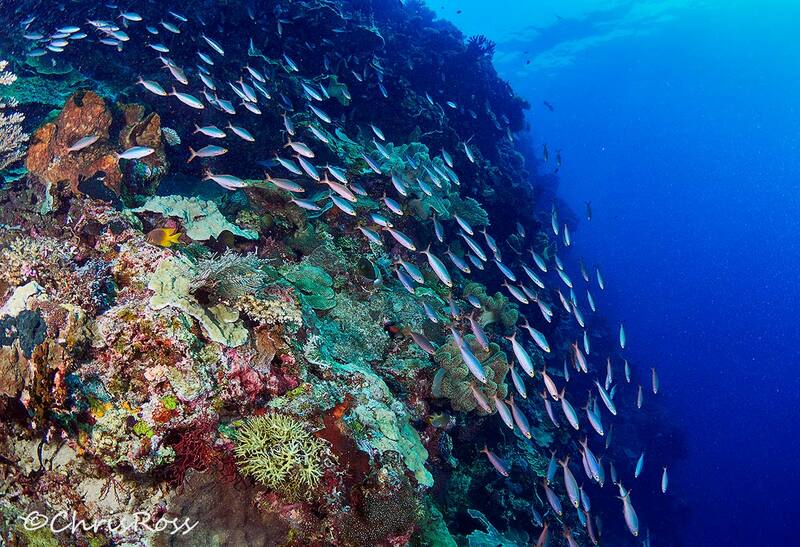 Lovely capture of the flow of fish around the reef, Chris! I could label this one "Toward the Abyss". Great colors and motion.